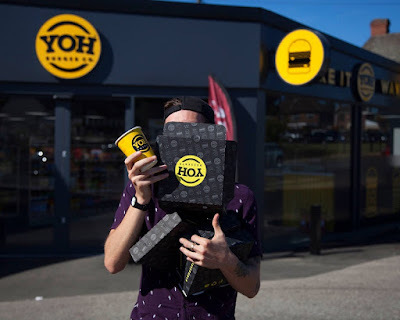 YOH Burger has launched in Rotherham offering handmade burgers, wraps, salads and desserts in a retro-inspired casual diner. The new food outlet is situated at the Fizwilliam Service Station in Eastwood where enterprising operator, Fuzail Patel, has undertaken the conversion to offer something different at the petrol station. Plans were approved last year for a change of use at the service station and retail store which also involved demolishing the car wash to create further parking spaces and outdoor seating. Following a substantial fit out, a launch event was held this weekend and the restaurant's approach to burgers is similar to Subway's approach to sandwiches. Diners are given choices of breads and fillings and invited to "make it YOH way." The store also features a dedicated dessert counter with fresh cakes, ice creams, premium milkshakes, waffles and cookie dough. The Rotherham opening could be the first of many for the new brand. A spokesperson told thebusinessdesk.com: "We are delighted to open our first in Rotherham and bring a unique concept to the town. "We genuinely believe our build-your-own burger concept and our emphasis on fresh quality locally sourced products is something the region has never experienced before. "As a company we have ambitious plans to take this concept across the UK not only to forecourts but also on the High Street as a standalone concept. "Our aim going forward is to really drive our expansion in Yorkshire and want this Fitzwilliam Road store to be the first of a long chain in the region creating jobs for the locality." Another Halal fast food outlet that I will give a miss,if people really knew what happened to the way animals were slaughtered they’d never eat tt ! Why don't you hold a protest about it at the location you are implying at? You have the balls to be keyboard warrior (and being anonymous) but do you have the balls to go up to the premises and tell them how you actually feel? You mug!! Iv actually been in the premises & after asking was told it was halal ,I have no doubt judging by your reply you work in a similar establishment !! I love to go and demo against it,would only lead to being arrested and being called "wacist"so.whats the use,simply spread word and dont use it,I ready dont use any takeaways that do Halal meat as do all my family and everyone I know.The war will be won and halal slaughter will eventually be banned on.these shores.Times are changing and animal cruelty is unnecessary and unacceptable ! My name is sef akram. I have a clothing business in Rotherham town centre!! I thought my name would show as I have nothing to hide. I did register with my name on. Did you not stand there and tell them I don't agree with the way you slaughter the animals? Any way as you want people to know about how Muslims slaughter animals, I think you should Wright a story about it and get it published in advertiser! Maybe stand outside the premises and ask the ITV news to interview view and while your at it identify yourself to the public on live T.V. look here you uneducated, no good for nothing.... you have beef with either the religion or the way we slaughter animals, either way do something about it. I'll also tell you something now cocker, your not being heard on here. Nobody is looking at your hatred comment. I'd like to add one more thing, meat is meat!! No matter how the animal is killed. Majority of the world don't think about how it's killed. We just eat it!! Sef,on.these shores we are concerned about how an.animal is killed,they deserve respect,not terror in.there last moment's! Halal slaughter will never be banned, I can guarantee you that! Have you ever heard of a peaceful demo? If you haven't I can guide you to that. Not many people are bothered about how meat makes it onto their plate> I reckon even less are bothered about your opinions on the matter. There’s only one racist on here and that's you SEF -the original post is about the slaughter of animals, if it had of been a Kosher establishment for example then it’s still unacceptable, but that doesn’t mean the person doesn’t like Jews, do you follow? You have shown your true colours by trading insults on someone with a different opinion.Shame on you ! No such.thing as a peaceful demo,where these particular people are concerned,I guarantee that,would have all there leftist thug friends there too,screaming racist. Which ever way an animal is killed, it is tourtre for them. So, let's for get about it and like Farfan said not many people are bothered. Yes. Shame on me. Why don't you take these comments to the police and let them judge it, if I'm being racists? Go on. And while your at it, take your pathetic sad, no good for nothing sad life to the parliament and tell them how you feel about Muslims slaughtering animals! I'm sure you will look a right Pratt to them. Good luck key board warrior!! Am out!! Unknown,you'll find that many in parliament are against "ritual"slaughter,it as no place ina modern Society,indeed The RSPCA are totally against it.Thing will change regarding this issue.Why would a minority that represent less than 3 % of population old sway? OMG, guys enough with the bickering lol. I can see where you're coming from mate about the slaughter of animals and you obviously feel passionately about that, your opinion and perspective which i'm sure everyone respects that. So simple solution, don't go to YOH Burger which I'm certain you won't along with family, friends and people you know. Fair do. However MANY food establishments (including major chains) are now halal now to cater for everyone and maximize potential revenue. We're a multicultural and diverse country so it seems to make good business sense as a huge amount more people will still frequent them than boycott them in the long run. If animal welfare is that strong with you, why aren't you vegan? Eastwood has a large Asian community so no surprise that the meat is going to be Halal, as is nearly all fast food in the Rotherham area now! On the subject of YOH Burger. I haven't been here yet and would be tempted to following the google reviews etc... and as i'm fine with how the animal is brought to plate, as long as the meat is fresh, clean and of good quality. Looks a bit like a five guys style setup and if it's fresh and made to order like them then fair play and good luck. looks nice but why is the owner of the company posting a google review to boost his own ratings? Just be honest and let other people's opinions do the talking man. Fantastic! Loved building my own burger - I choose a brioch bun, beef, grilled egg, grilled onions, hash brown, secret Yoh sauce with a cheesy fries box. You can taste the quality of beef which I was informed is made on site! Difficult to trust a place when the owner posts a review posing as a customer and gets family and friends to also post 5 star reviews. Also most of the reviews have this as their only review!!!!!!! Irrespective of how you slaughter, the pain an animals will go through only an animal can say. The rest is just theory. Seen as though your very keen on this topic I will help educate you a little. Part of the Islamic way slaughter as you are aware includes a clean cut throat method (instant slaughter) then draining of animal blood completely from body which has many benefits such as clean poultry/meat, gets rid of bacteria and germs from animal, healthy / less chance off humans catching illnesses and more. The other way is stunning to the head witb a bolt via high voltage leaving the animal alive yet unconscious for a longer period then applying cut throat (the latter carried out in uk and assuming your preferred way for less cruelty to the animal etc,"quote theory"). However this method of stunning can be more damaging to the animals, majority animals die before the procedure to come after (especially with chickens, cows etc get stunned for longer periods). Should the animal suffer from death before cut throat then the blood is retained within animal freezing up with all bacteria and germs within , also depriving the benefits. Trust this helps. Both methods the animal will suffer for a period of time before death which way is quicker depends on animal somewhat aswell. Carry out your research properly then make your descion rather rant and rave about how an animal is killed without comparing the reasonings behind it. if all else fails and animal cruelty affects you that much, i would seriously suggest becoming a vegan and ONLY THEN carry out your protest. Sorry no one wants a lecture from you about the various methods of Halal slaughter, it’s barbaric!,so don’t come on here trying to defend it as you clearly have no respect for animal welfare let alone the opinions of non Islamic people!